That’s my word for 2013. The year is going by quickly– over half gone already. If you’re like me, you find that hard to believe. Something about becoming a parent, or perhaps just growing older, causes time to fly. So it’s time to evaluate how the word commit has influenced me so far. I chose the word with the intention of using it to force me to change certain behaviors, adapt to new behaviors, and make me stronger both physically and mentally. I’ve committed to seeking God with every part of my life. Not that I wasn’t doing this before, but I will thread Jesus into every fiber of my being so tightly that when others look at me, especially my children, they see that my life is nothing without Christ. I am nothing without Him. I’m only held together by Him. My children are eager to learn scripture and read Bible stories. They love talking to, and about, Jesus. This is not of my doing, but I hope it’s partly because we’ve set that example in our home. I’ve committed to exercise and health. I will lose all this baby weight, and I will be healthier than I’ve ever been in my life. Because I’m eating healthier, my entire family is eating healthier. We’re not perfect (I refuse to give up chocolate), but I’m thankful that my family appreciates some healthy foods. My boys watch me exercise and I encourage them to join in. Their little bodies being a temple and all– I want them to establish healthy routines early. I’ve committed to service and teaching. I will serve when God asks. God has opened several doors for me in this area. Not only am I now teaching Sunday school, I will soon be leading a Bible study and re-launching the Women’s Ministry at my church. Big things are happening. I’ve committed to writing. I will carve out time to write new material. I will be more active in the writing community than I’ve been in the past year. Because I’ve spent the first half of this year either being pregnant or caring for a newborn (he’s three months old already! ), I haven’t gotten very far on this one. I have story ideas popping in my head all the time, but I haven’t been able to establish a routine that allows me good writing time– yet. School starts back soon so my oldest 2 will get back to their normal routine and the baby will adapt to our routine. I’m looking forward to carving some writing time in there somewhere. I’m committed to it. What has inspired me most about this word for 2013 is that along with it comes determination. 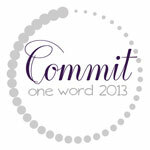 I can’t “commit” to this word without directing that I will do certain things. It has forced me to do exactly what I’d hoped– change behaviors, make new behaviors routine, and seek out opportunities. I can’t wait to see what the rest of this year brings. Yesterday afternoon, a small dog was hit by a car on a New Mexico road. The driver didn’t stop, and the impact flung her into a water-filled ditch with a broken back. She fought desperately to keep her head out of the water to breathe, while a big Pit Bull behind a fence a few feet away barked for help, and to encourage her. Today, she is in a warm, padded crate, watching me as I write. She has many new canine friends, and tomorrow we will build her a wheelchair. She’s found her forever home. What would her word be, I wonder? I think it might be far more meaningful than mine.